Eggnog is one of my family’s favorite holiday traditions. We drink it starting at Thanksgiving and all the way to New Year’s Eve. I like the traditional thick and creamy eggnogs, and as long as I don’t drink too much of it I will indulge a few times throughout the season. 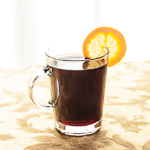 For those who want the creamy without extra calories, I recommend this recipe from Cooking Light’s list of smart choice holiday cocktails. Instead of heavy cream or whole milk, this recipe uses 1% milk and fat free sweetened condensed milk, with only two egg yolks, though if you like more egg flavor you can add one extra yolk. I’ve served this both hot and cold, and it tastes great either way. 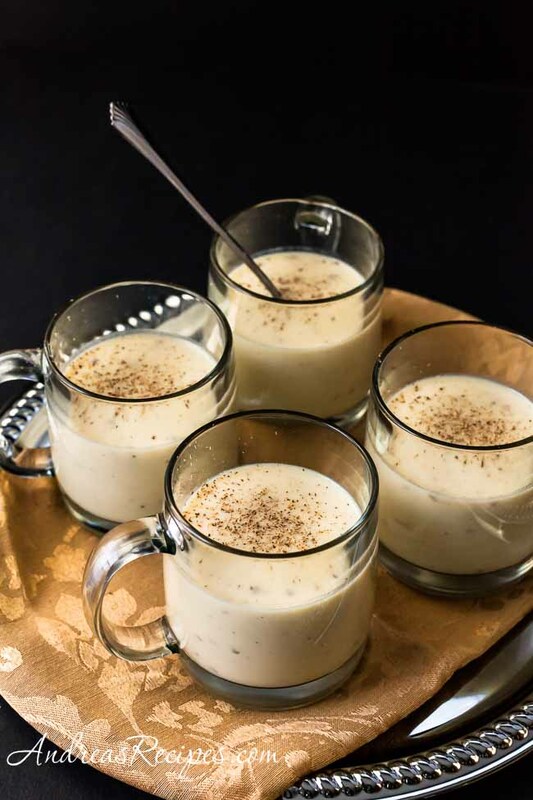 So if you are trying to warm up from a cold day outside, or if it’s warm in your neck of the woods and you need something cool and refreshing, this light and easy eggnog will hit the spot. Combine the milk, sweetened condensed milk, flour, nutmeg, vanilla bean, and salt in the medium saucepan. Slowly bring to a boil over medium heat, stirring constantly with a whisk. Remove the piece of vanilla. Whisk the egg yolks in the small bowl, then gradually whisk one-third of hot milk mixture into egg yolks. Add yolk mixture to remaining hot milk mixture, stirring with a whisk. Cook over medium heat until slightly thickened, about 1 minute. Remove from heat and stir in the bourbon and brandy. 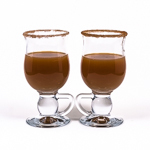 Serve hot in mugs, garnished with grated nutmeg. To serve cold, cover the surface of the eggnog with wax paper, and refrigerate at least 4 hours or overnight. Because I like a rich egg flavor, I used three egg yolks, which only adds a few calories per serving. The original recipe calls for vanilla extract stirred in at the end, but I like the flavor of a piece of vanilla bean infusing the milk mixture while it cooks. 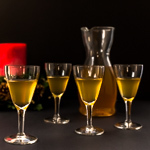 Depending on your booze preferences, you can reduce the bourbon, omit the brandy (I did), change it all up for rum, or skip the alcohol altogether. Happy New Year, Andrea! My husband uses leftover egg nog to make waffles. Have you tried that? Hi Lydia! Oh yes, we use leftover eggnog–when there is any–in waffles, pancakes, and poundcake. Happy New Year!